Journalism Is the Second-Worst Job? Hah! Advertisers Are the Least Trusted! Good news! Journalists are moving up in the professional world! 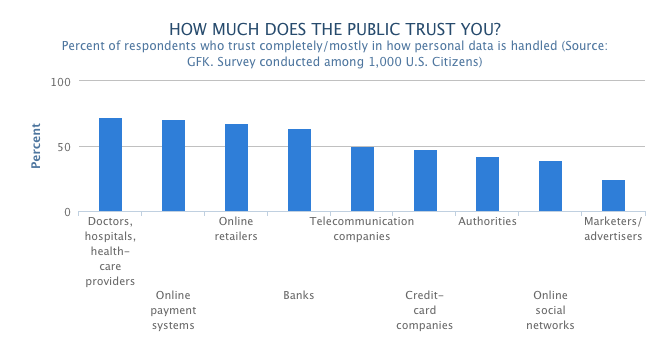 Consumers trust marketers and advertisers with their data about as far as they can throw ’em. More than half of those participating in a recent privacy study said doctors, search engines and banks warrant their trust when it comes to personal data protection. Marketers and advertisers, on the other hand, elicted the least faith from those surveyed; just 25% said the industry is trustworthy with personal information. It’s better to be a journalist than a huckster. This entry was posted in Uncategorized and tagged Advertising Age, CareerCast, FishbowlNY, GfK, Graham Chapman, hucksters, journalists, lumberjack, MediaBistro, Monty Python, The Data Issue, top 200 jobs. Bookmark the permalink. 4 Responses to Journalism Is the Second-Worst Job? Hah! Advertisers Are the Least Trusted! You say that like it’s a bad thing, Bob. Enjoy it while there’s still a recognized difference between reporters and advertisers. Btw – methinks it was Michael Palin. Yeah – Palin, Terry Jones, and Fred Tomlinson wrote it (at least according to – God forgive me – Wikipedia), but Graham Chapmen was in it.